This is information from Mr.Takeshita. Channeling or UFO information is flooded with erroneous concepts of spiritual world. I have clearly defined my concepts of spiritual world in video lectures on science of religion and in my comments posted on Shanti Phula’s blog. I fear there is a possibility that my concepts will be mistaken for such erroneous concepts. And so I’d like to explain the key points in a serial form. Our universe is divided into 12 Systems. We, humans belong to the lowest level-- the 1st System (Sirius System). Each System is divided into 10 levels, which include five 1st to 5th levels of Amatsukami (Heavenly Deity) and five 1st to 5th levels of Kunitsukami (Earthly Deity). Each level has primal deities governing the entities of the level and the Supreme Deity above the deities. With the following table, you can easily understand these systems. In the above table, numbers 8, 7, 6, 5 and 4 are assigned to the 1st to 5th levels of Earthly Deity in the 1st System. These numbers 8 to 4 are the numbers showing “dimensions” which often appear in channeling and UFO related information. For example, the 3rd level of Earthly Deity in the 1st System is the 6th dimension and the 3rd level of Earthly Deity in the 2nd System is the 11th dimension. 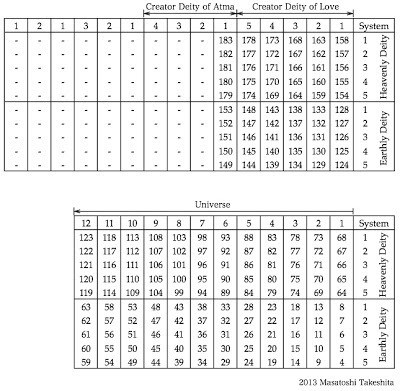 As you can see in the table, Heavenly Deity level and Earthly Deity level are 60 stages apart in dimension. For this reason, what we have referred to as deities means Earthly deities in most regions and Heavenly deities have not been recognized. As far as I know, Japan is the only place where Heavenly deities are enshrined on Earth. In a word, all Egyptian deities and Hindu deities belong to Earthly deities. 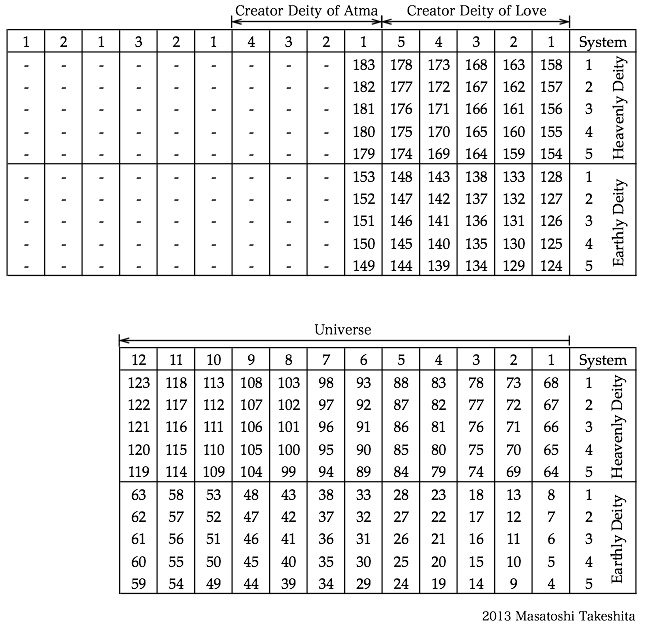 As shown in the in the table, there are six systems superior to the 12 Systems; five “Creator Deity of Love” Systems and one “Creator Deity of Atma” System. As is the case with the 12 Systems, numbers are assigned to each system. Our universe is the whole of 12 Systems. “Creator Deity of Love” Systems or above are the dimensions beyond our universe. The 183rd dimension is the highest dimension where personal deities exist and no personal deities exist in higher dimension, for which no numbers are assigned. As a result of a reform of celestial world which started in 2007, the 1st “Creator Deity of Atma” System has been added as a new dimension. Before that, the 178th dimension had been the highest level where personal deities exist. Thus our universe and higher dimensions continue to evolve together. Fairies exist in all dimensions from the 4th dimension through the 183rd dimension. On the other hand, humans can exist in up to the 12th System and do not exist in the 1st and 2nd levels of Heavenly Deity or 1st and 2nd levels of Earthly Deity in the 12 Systems. With spiritual advancement on Earth, humans have attained a higher dimensional level of awareness and after death they will be reborn in the dimension they have reached.